When I got married I was very excited to get a chance to create and run a home from scratch , it was like an elderly version of playing doll house for me. I was working then and only got weekends to care for it. But the too I understood and cared for what goes into my food. I am never fond of fried stuffs but Hubby is a big fan of Chanachur (Bombay Mix?/ fried spicy mixture of peanuts, chips and other chickpea flour based items) and fried fritters. So following my Maa I also started making these at home. Whenever I get time I prepare chanachur and Nimki (Namakpare/ savoury snack) in big quantities to survive us for quite some time. I alos started making my own pickles and Amchurs. Now a day’s my parents and my Brother’s family get their yearly supply of these from me. We get very good quality mangoes in Bangalore and we also have three mango trees in the backyard so every summer I make big batches and send them across to family and friends. Aam in Hindi and Bengali means mangoes and Amchur or dried Mangoes are literally sundried sliced raw mangoes. These are the preserved form, which could be used whole year round in curries and chutneys and has a lovely tangy aroma. These days dried amchur powders are also available in the market. Both my parents hail from two different coastal districts of Bengal and like any other coastal food they also grew up eating food with a dominating sour taste. In our family its Macher tak (pronounced as 'tak'); a fish dish either prepared with tamarind pulp (also known as Macher Ambol) or with amchur and mustard paste. For my Baba (father), Dada (elder Brother) and Bhai (younger brother) lunch is not complete without this sour tasting fish dish and following this they need a constant supply of Amchur. Today am sharing how I prepare Amchur and trust me this is as easy as saying 1-2-3. The amchurs in the picture are what I made last summer with the produce from my backyard. I don’t have a step by step picture so will update this post later this Summer when I’ll make another batch. Quantity depends on how much you want to make. Depending on the sourness of the mango generally a piece or two is enough for a curry serving 4 persons. The quality of mangoes is very crucial for this recipe. The best quality would be very sour, fresh, juicy, hard mangoes with thick flesh. Salt: ½ cup; salt here works as a preserving agent. Depending on the type of the mangoes you might have to adjust the quantity. Plenty of Sunlight at-least for 3 consecutive days. Wash the mangoes and pat dry with a kitchen towel. Peel and cut in half or quarter and put in a bowl of water. While peelings make sure no green skin is visible on the body as this will lead to blackening of the prepared amchurs later. After 15-20 minutes take the pieces out from the water and place in a big bowl (preferably plastic or ceramics) and mix in the salt. Shake vigorously to coat the mango pieces with salt. Cover and leave it overnight. The raw mangoes will leave a lot of juice. Next morning take out the pieces one by one and place them on a clean plastic sheet (flesh side up) and let them dry for the whole day. In the evening again put these pieces in the juice. Taste and if needed add more salt to it. Shake well and leave overnight. For next two days follow the same process or till you get dry mangoes with a white coating of salt on top. Preserve in an airtight container. This remains good for a long time and by that I mean 2-3 years. To use in curries: soak the dry mango pieces in water for 15 minutes and mash them with your hand. Use as required. I prepared my Kumro posto’r chatni (sweet n sour chutney made with pumpkin, dried mangoes and poppy seeds paste) with my homemade amchurs. I thought of preparing Macher tak for this month’s Think Spice: Amchur event hosted by Bhagyashri of Taste buds but she is not accepting non vegetarian recipe so this know how goes to our very dear Think Spice event which is a brainchild of Sunita. nice detailed explanation on making amchur. Wow thats really very tempting..looks great! Thanks so much for stopping by my blog! Your recipes look fantastic. I love mangoes...they are by far my favorite fruit so I am definitely going to have to try this! WOW! That looks great. We never get good raw Mangoes here. Great post with good info of making Amchoor. Pics are fab. You took me back many decades to my child hooddays in Orissa..come raw mango season, every one will make this, dry whole day and soak whole night days in days out. Thats a very detailed and informative post! Preserved mangoes what a wonderful idea.It would be good for us in Uk as can only get mangoes certain time of year. this is awesome... mom used to make them when I was growing up... Wow! Amchur powder at home....?! souds tempting! oh wow, Sayantani, home-made aamchur looks so fresh and very nice description of how to make it too. If only, I got fresh good raw mangoes.. this recipe is sure a keeper! WOw that definitely a great response in 24 hours. thanks aton buddies for all these supports. @Kitchen Queen, Priya, Asha, thanks. @Jagruti, we love this house only because we have so much open space to try our green fingers. @Joanne, welcome to my page. i loved your site as you are a great cook yourself. 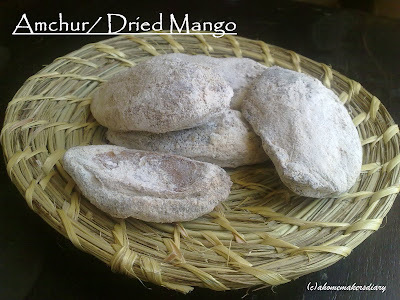 @Ushnishda, same here I love to eat the semi dry mangoes at the end of the first day. all the juices dries up and very soft salty texture remains. jibhe jol ese gelo. @Gulmohor, dont miss that, its a time well spent. @Rachna and Simply.food, thanks that you find it detailed. i was really not sure if I am able to make others understand. @Karine, thanks for visiting me and am glad that you liked it. @Cham, OH thats bad but if you want I can send you some. no problem. 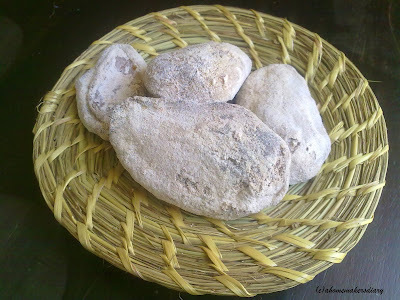 @Sharmilee, thats not powder but only dried form of raw mangoes. @Indrani, thanks for your appreciation but am inspired fro you all, everyday when I go through my dashboard i get the inspiraion to cook something new. am glad that you liked it dear. @Sushma, Rujuta, a big thanks. @Kalyani. yes chur/churan or churna means powder. @Malar and PJ, I guess these are only made in the eastern coast of India like bengal and Orissa. rest of India is acquainted with the amchur dust. My mouth is watering saya. You have mango trees in the backyard? I crave for mango pickles come summer- I should make these this year. You have an excellent collections.I loved your blog. Wow! Thanks for this awesome post. Great post, very detailed explanation, good one! Cool, I never knew making amchur could be this simple, will definitely try if I manage to find mangoes of the kind you mentioned! nice and detailed presentation..looks so tempting.. Wow..I love to learn basics like this..
OMG Sayantani..U are great. I love using amchur powder in my cooking. To think someone must be making it from scratch is unbelievable. Save some for me..who knows we might meet and if we do, I'll take my share of home made amchur..lol. Also love reading ur posts..I enjoy ur writing..Ur good at it and reading ur posts actually makes me belive we were there too with u. I have missed quite of ur fabulous posts, I guess I've been too busy this whole mth of february and wish to be rt back into routine.I'll sneak in again and read more. Great post! Thanks for the entry. I stumbled upon your blog and came to a world of authentic bengali recipes. The post which I have read are really gud with gud pics & write ups..
Would you also post a recipe of Chanachur if possible as I too wanted to try making it at home..
Hey Vijeta, thanks for your visit and your comment. You know what I used to make chanachur following maa's recipe when I was in Bangalore. but now being in Kolkata and the easy availability has spoilt me...but definitely will try to make and post it soon for you. I am essentially from Paschim Medinipur, in West Bengal. Puro edeshi. The main difference I see in macher tok in all the food forums, and what I identify as macher tok is this. There is essentially always a bit of jaggery or sugar added to the tok along with tamarind or mango. But in Medinipur , tok means just tok. A blistering sourness of tamarind or mango with no sweetness whatsoever in the tok. And that's what I love. I remember my childhood, where a meal was incomplete without tok in the end. And macher tok ranged from chuno mach (assortment of small fresh water/pond fish, smiliar looking to silver fish) to elish mach and chingri mach (small fresh water shrimp for tok). I love cooking and thankfully in Bangalore lately I am getting elish and chuno mach quite regularly. So tok is never a problem at home. What I do miss however is proper tok amchur. And in Bengal when we say amchur we do mean the dried salted mango. Not the powder. Thank you for the recipe. I will get my Ma to ship the proper tok mangoes to me from Kharagpur so I can make them myself. Totally agree with you Phantom Lord. Which part of Midnapore are you from? Hi Sayantani, I am originally from Kharagpur.